save animals and trees and always believe in the words "live and let live". I live in a captivity where there is wonderful nature and a vast flora and fauna. Just a few kilometers away from my home is a lake which is home to more than 100 species of birds. Anyways, this is not a "lake" but is a wasteyard with sewage treated water dumped there. TRIP TO CORBETT NATIONAL PARK. The day I am sharing was just like another normal scheduled day to work when I was getting ready & was about to leave home for my job. Suddenly my husband asked a very surprising but interesting question Hey! Would you like to visit Jim Corbett National Park. Amazed & awed unable to make out I said “no” I cant, I have to reach my work place in time and moreover I have not applied for any leave. During this time, examination were going on in the college and I was on examination duty. But unable to control my zeal and emotions I applied for leave, got it approved and within an hour of packing and arranging we left for our journey to Jim Corbett National Park. The most interesting part being, no bookings were made in advance, neither did we have any idea of the way to be followed. Unaware of anything we decided to move on. From Chandigarh we started at 11.30am & through Jagadhari , Yamunanagar & Rorkee at 5.12p.m. we were at Haridwar. Now there was no idea and while on the way we checked for hotels, resorts and jeep safari ‘s on the internet. We got in touch with a travelling operator who kept us guiding from New Delhi. He gave us the address of a resort called ‘ Jagaar Jungle Resort’. Lateron we came to know that he was the owner of the resort and the couple handled their business from New Delhi. I would like to mention that they were cooperative to an extent and kept guiding us till we reached the resort. From Haridwar taking a right turn towards Nazibabad we were on the state highway 34.While moving towards Nazibabad we were crossing an area that was under Reserved Forests just close to Raja ji National Park. On the way we could find sign boards showing “ Elephants crossing Area; Drive slowly”. This made us more anxious and little fear had also taken over us. We were heading towards our destination on an unknown road. This led to make more frantic calls to our tour operator asking him every now and then which way to follow, are we on safer road or not? From Nazibabad we moved towards Nagina-Dhampur-Afjalgarh-Kashipur.Our resort Jagaar was close to Kashipur touching the buffer zone of Jim Corbett National Park. It was 9.40 pm that we reached the resort following an unpaved road through a village in pitch dark. The aura and ambience of the resort was completely raw. Small thatched cottages with wooden doors and little bulb lights on the path leading to our cottage gave the resort a complete wild look.As we were enjoying the dinner, conversing with the staff of the resort we came to know about various stories of the tiger especially the man-eater which was killed by the villagers 2-3 months back. Only one small latch on the door was the safety in the cottage. Initially unable to sleep, both of us were lying silently without talking to each other and hearing some strange noises from outside, we slept saying good night as early morning at 5 we had to get a wake up call from the resort staff. At 1.00 a.m. my sleep was interrupted by some noise and I could see my husband still lying in the same position with his eyes wide open.Shockingly I asked, what happened and back came the reply I am unable to sleep.Some stupid scary noises kept him awake. So at 5.00 in the morning we got a call and within half an hour, the resort staff handed over to us our breakfast packed and guided us towards Ramnagar the tiny town 8 kms away from the resort. We drove by our own car to Ramnagar. Here I would like to mention one very strange thing. At 5.30 or so we were at Ramnagar and the whole town was bustling with life. Markets open, people shopping at early dawn. I never saw such a thing in my life. On asking some local people we came to know that from this little town buses move to various higher reaches of Uttrakhand which are far away. So markets remain open at Ramnagar to facilitate people who are travelling. From the Ramnagar forest guest house and ticket counter we took tickets for Dhikaka forest range. We got tickets for a canter i.e. a huge truck open from all sides. Corbett National Park is situated in the foothills of the Himalayas. 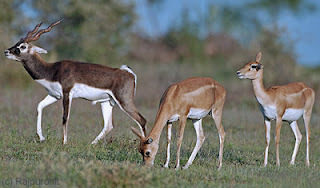 The present area of Corbett National Park is1318.54 sq. km .including 520 sq. km. core area of and 797.72 sq.km.of buffer area. Corbett has four forest ranges: Dhikala, Domunda, Sonanadi, Bijrani and Jhirna. Main vegetation found at Corbett National Park is sal, khair, ber, bel, semal, khingan, rohini and bamboo. River Ramganga is the most important river and its tributaries are sonanadi, mandaland palain. River Kosi runs proximate to the park and is also a prominent resource. We were little late and almost all vehicles had already left for the Dhikala range. Our canter started at 7.00a.m.. As we entered the forest we first saw a Sambhar who was about to cross the road but stopped because the canter was too noisy. Suddenly the canter got slow and driver was showing us the pug marks which were fresh. He told us that the tiger may just had passed from here few hours before after having water from the nearby Ram ganga rivulet. This raised the anxiety of every person sitting in the canter. People started watching more cautiously and we were lucky to spot peacock and wag tail within first 10-20 min of our tour. The canter was so noisy that everyone was getting irritated because as soon as we could spot something the driver was unable to hear us. It was really surprising why the government has allowed such noisy vehicles inside the forest range. The animals will not come close to noise. Even as the forest department is charging hefty amounts,the vehicles are not properly maintained. What to talk about the tiger, we could see small animals and few birds retreating from noise. Some spotted deer could be seen near the river bed. Wild Boar were moving in a group following a straight line with parents leading their off springs. Suddenly we asked the driver to stop as a Brown Eagle was sitting in the middle of the road. We clicked 2-3 good shots and moved ahead. But we were only thinking about TIGER keeping our fingers crossed,praying just to have one look of the beautiful creature in the wild. As we approached the Dhikala guest house we spotted tamed elephants nearby. The area was fenced with electrified barbed wires. As the driver parked the canter we saw a big Vulture on the nearby tree, feeding its young ones. 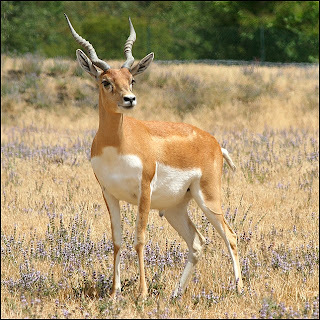 People were talking about its extinction due to excessive use of Diclofenac, an anti-inflammatory drug used by farmers to ease pain in cattle. The canter had to stop for 45 minutes so this was the time to talk to strangers exchange views photographs and get fresh. We had maggi and omlette and hot tea. There was a notice board where people shared their tour experiences. A group saw leopard and tiger an hour ago near guest house. So the excitement grew more and we started moving ahead through the grasslands. As the canter moved through the thick long grass we were gazing every spot with eyes wide open only searching for the tiger. The canter stopped in the middle of the grasslands where tamed elephants were eating grass. Suddenly an elephant came so close that its trunk was almost inside the canter smelling the strangers. The driver told us about the Ramganga river flowing nearby which also is a home to ghariyals, turtles and also a major source of water in the park. By this time we were exhausted and sad but still we were hopeful to spot a tiger. So we decided to go for another safari to Bijrani but now by a jeep. We came back to the resort, got fresh had lunch and asked the resort staff to arrange a jeep safari for us. The booking was done for at 3.30 in the afternoon. It was a tough nut to crack as only limited number of jeeps is allowed to enter the forest in the morning and evening. Now we drove again till Bijrani gate by our own car which is 12 kms from Ramnagar. The zone can be entered via Amanda Gate and the Bijrani Zone can be found 5 kms from there. The tourists are taken around the area by a jeep and presence of guide is mandatory as they help the tourists understand the importance of the park and also the habitats of the animals in the zone. The jeep was waiting for us and we two along with a guide and driver entered the Bijrani forest. The guide a young chap with an experience of over 5 years started telling us about the Bijrani forest its flora and fauna. But we kept asking him so many questions on tiger. He told us what to do if a tiger approaches. Keep your body still without moving and making noise let the tiger go. He told us a story of a group who were forced to stop because a tiger came suddenly in their way. The guide told everyone to sit and the tiger smelled the entire jeep then went. It gave us more anxiety but fear had gripped us by now as the forest was too thick. As we were heading toward Malani, a forest guest house in Bijrani, we spotted a wild tusker near the river. The guide showed us a big owl on the tree. As we moved ahead we stopped the jeep for some time to hear the calls of the Monkeys, Grey Langoors and Deer for tracing the Tiger. But within minutes we were fearful that if the tiger is around then it can be dangerous so we started again. We saw Wild Boar, Spotted Deer, Barking Deer, Red Jungle Fowl, Brown Eagle, Grey Langoors, Rhesus Monkeys & Black Crane. The canopies of the trees were too thick and the forest was very dense. All the jeeps inside Bijrani meet at a centre place where there is a watch tower. The tourists and the guides exchange their tracking routes of tiger spotting if any. The slopes were steep and at times gentle. It made us to think what would happen if the tiger comes as the path followed by the jeep was undulating. We also saw the places were tiger usually comes for drinking water. Some were man made while others were natural sources. Sun started setting and we had to move back as the time for the safari was coming to an end. On way back we saw few settlements near the buffer zone where the forest department had put fenced barbed wires but the people had taken them off and they were fearlessly living inside the park. So the safari was over but tiger could not be spotted. In comparison to Dhikala, Bijrani is more drier and also has more diverse vegetation. Sad yet still excited we came out and to change our mood we entered a souvenir shop where things related to tiger were being sold like t-shirts, caps, key rings,paintings etc. We were back to the resort, had dinner, shared about our tour with the resort staff. Since we had to leave next morning so we slept in time.Next morning after having tea we were taken to a water pump near the fields where the resort had arranged for a rustic bath. My husband enjoyed bathing and then we had our breakfast and packed our stuff. We started our journey at 12.30in the afternoon and halted at Haridwar. Here we went to see the holy river Ganges and we bathed at Har ki Paudi. Since we were running short of time we just picked fruits from a roadside vendor and moved ahead. We had tea at Ambala and reached Chandigarh at about 8.45p.m..Though we could not spot the tiger but we enjoyed the nature at its best!